Designed for lovers of intelligent appliances, the studioLine range of dishwashers stands heads and shoulders above the competition with their flagship SN878D00PG model with features above and beyond your wildest expectations. Our favourite is without question the timeLight feature, which projects the remaining time and various other pieces of information on the floor directly in front of the dishwasher. This is quite useful as studioLine dishwashers are ridiculously quiet during operation, so quiet in fact that you’ll have a hard time telling if they’re running or not. We have displayed the SN878D00PG in the showroom and this is something we are always thankful for. If you’re a wine aficionado then you’ll positively adore the inclusion of a quality wine glass holder as standard. No hidden costs, this is part of the studioLine offering. Never doubt which program you have running with the clear and bright TFT display. 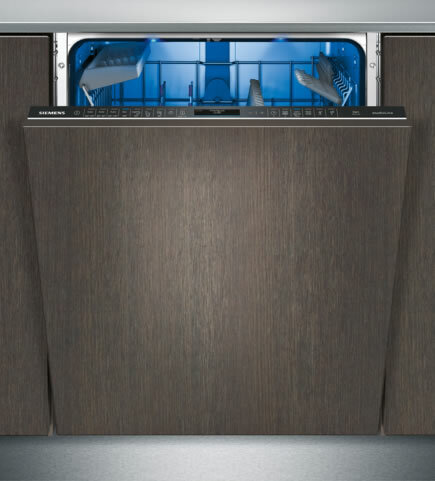 For those with handle-less kitchens the SN878D00PG features Siemens’ doorOpen Assist technology, which makes life infinitely easier. An let’s be honest, isn’t that the whole point of these high tech appliances? We have already spoken about the world going green, and this dishwasher is no exception of course. With the Economy 50 programme a mere 9.5 litres of water are used, and let us tell you this results in perfectly clean dishes, plates, cutlery, and glasses. You couldn’t possibly do such a good job by hand, and this is fully automatic! Finally the dosageAssist detergent dispenser ensures that exactly the right amount is mixed in with the water to ensure a perfect results without that tell-tale soapy smell you get from some lower end units. It seems like a small thing, but it can affect the smell and taste of your meals and nobody wants that.